We were having a clean out of old computer stuff and were about to throw away a pile of old discs, but I decided those shinny little things must be good for something else? 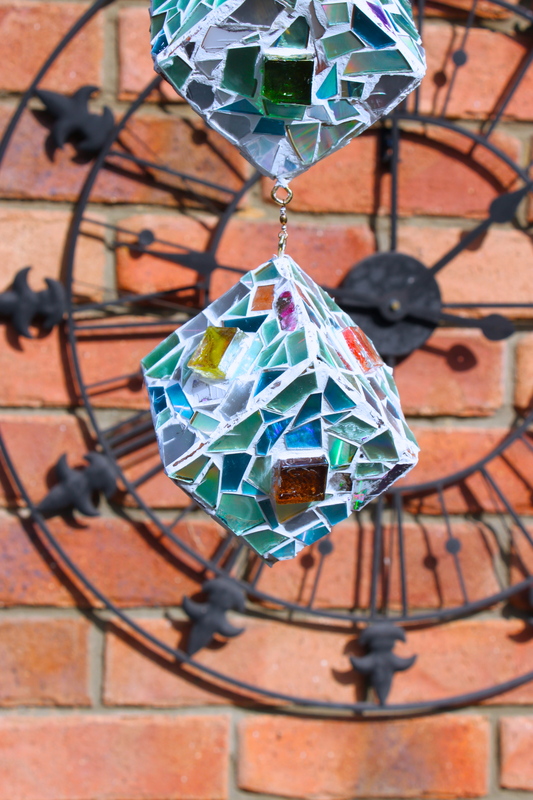 So after a bit of thinking, I came up with yet another sun catcher idea. Anyone would think I like sparkly things? It took me ages to work out what to cover, a sphere didn’t seem practical as the CD pieces are flat obviously, so after some uhmming and arrring, I decided wooden cubes were the best solution. The lovely man at the local hardware was kind enough to give me some 3″ x 3″ off cuts for free. The rest of the instructions are on the pictures. I just used clear drying craft glue to attach the CD chips to the wood and the grout is standard bathroom tile grout mixed according to instructions, available from any hardware (we had some left over from the laundry renovation). Gather your old CDs, DVDs the more different colours the better. Cut ’em up! Tin snips, side cutters, or seceteurs as I have. Drill hooks into each corner of the wood, placing a fishing swivel between, so they can spin freely in the wind. Stick on the pieces covering as much area as you can. 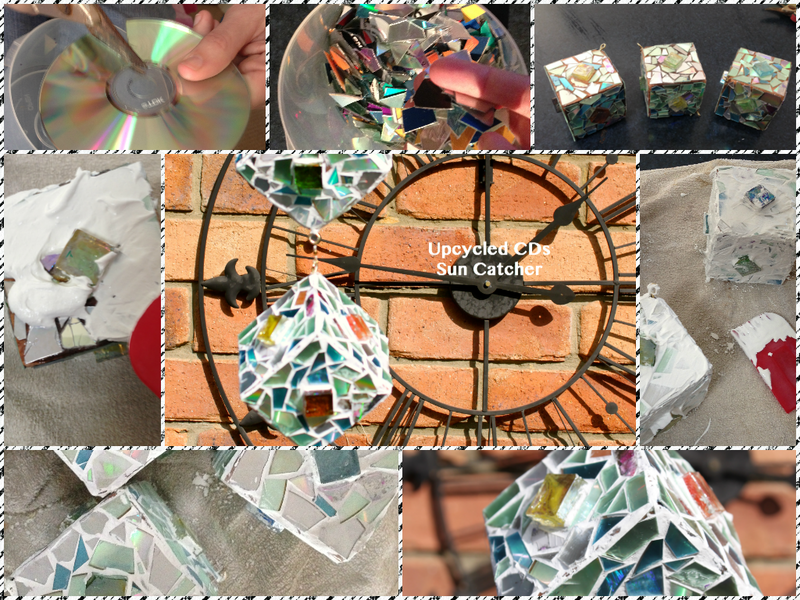 Make some grout, following instructions on pack. Use a dry or every so slightly damp sponge, remove more of the excess once it has set to a powdery consistency. Let set over night. Then wash off any excess dust. 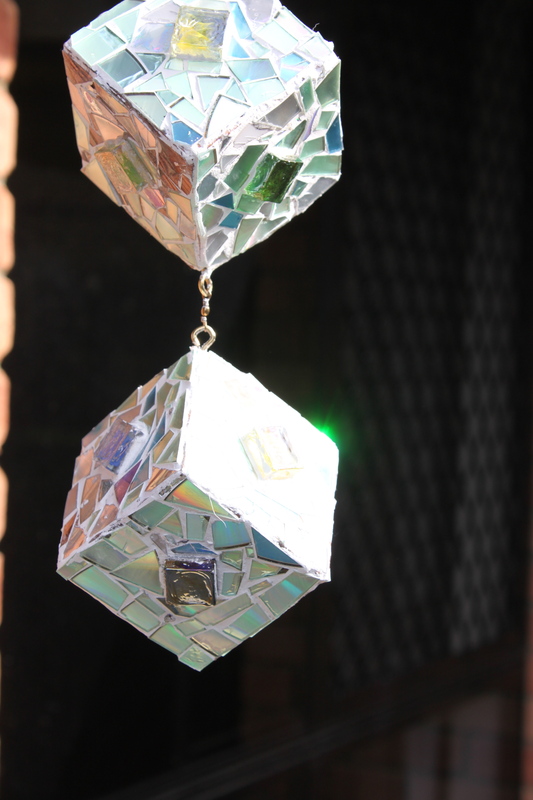 Sun catcher / Disco Cube!